In February 2013 I was invited to be part of the media pool which covered the Yukon Quest sled dog race which starts in Whitehose, Yukon and finishes in Fairbanks, Alaska by way of Dawson City. I knew next to nothing about dog sledding before my visit, but left fascinated by this little known sport. I also got to try my hand at driving a sled dog team and it was one of the enjoyable things I’ve done in all my travels. 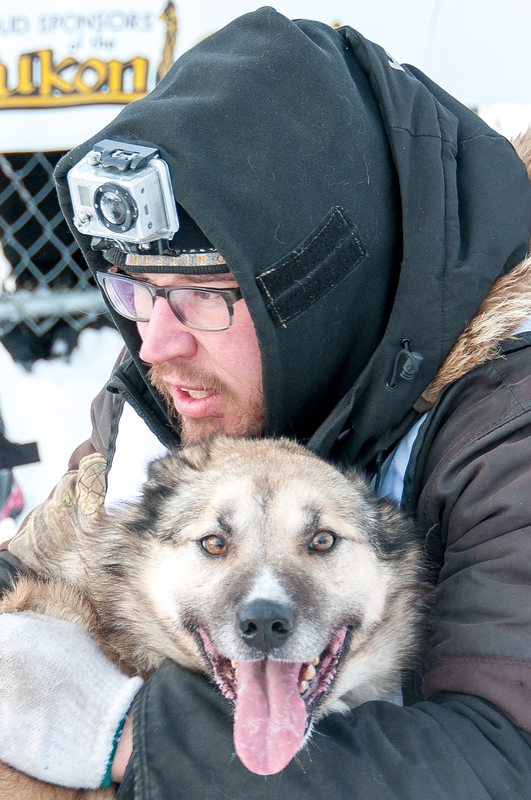 Photographing the dogs and the mushers was a pleasure and I developed a respect for the men, women and canines which compete in this extreme sport. 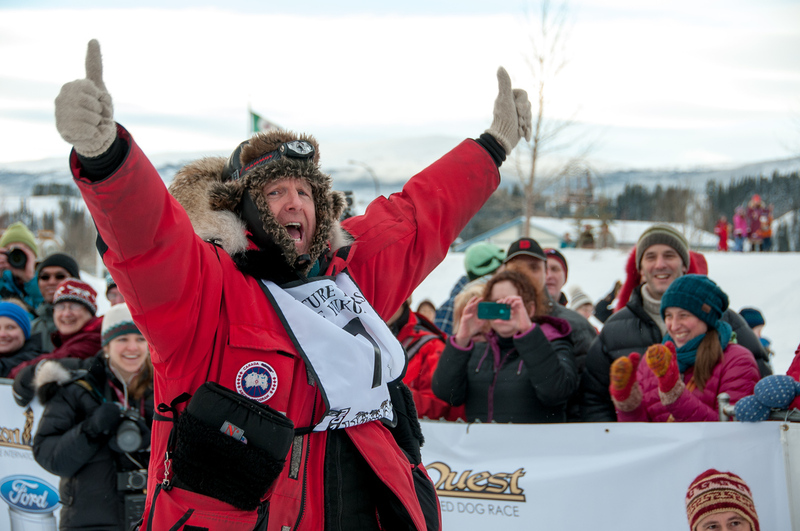 1Lance Mackey is a four time winner of both the Yukon Quest and the Iditarod. Prior to the start of the race, he was the center of most of the media attention. He had to drop out of the race midway through because of injuries to his dogs. I saw him in a Dawson City bar drunk and depressed after having to withdraw from the race. I can’t say I blamed him for how he felt. 2The food fed to the dogs is not your normal dry dog food in a bag. It is actually an extremely fatty liquid. It is a liquid so the dogs can hydrate and the high fat content provides the dogs the calories they need as they are pulling the sled. 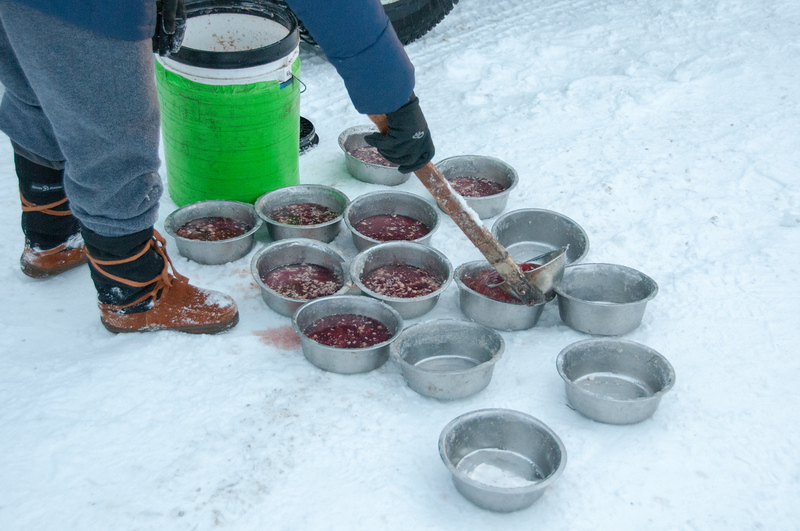 By combining the water and the food, it also makes it easier feed and transport when the mushers are on the trail. During the race, a dog can burn up to 10,000 calories each day. 3The starting line in Whitehorse, Yukon is popular event with hundreds of people in attendance. Mushers are sent out in 3 minute intervals amid cheering and fanfare. The time differences at the start are made up at mandatory rest stops along the way. 4There is far more attention given to the dogs than there is given to the mushers during the race. There are mandatory rest stops for the dogs, veterinarians at each stop and most of the gear on the sled is for the dogs. 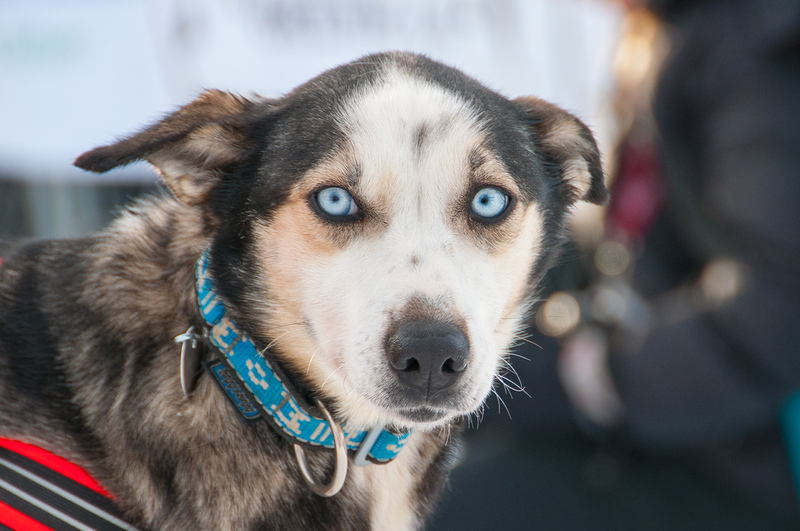 Most mushers get very little sleep during the race because most of the time spent during a rest stop is devoted to the dogs. 5Sled dogs are bred to run. There is nothing on a sled that a musher has to make the dogs go faster, only a brake. 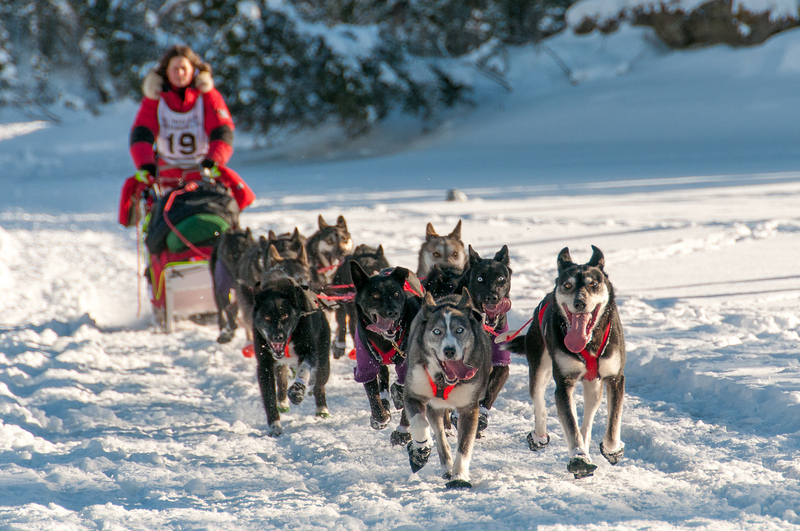 During the first several hours of the race, most mushers will stand on the brake the entire time to slow down their team so they don’t burn out too early. If a musher should fall off a sled, the dogs will not stop. 6Every musher will carry with them a bale of hay which is used by the dogs as bedding when they stop. At each checkpoint, they get a fresh bale for the dogs. The booties which each dog wears is a protective covering for their feet which protects the soft pads on their feet from getting cut by the ice. 7Many people assume that all sled dogs are large huskies. While some are, most of the dogs are actually smaller breeds which have more endurance. One thing I noticed was the many of the dogs have piercing blue eyes. 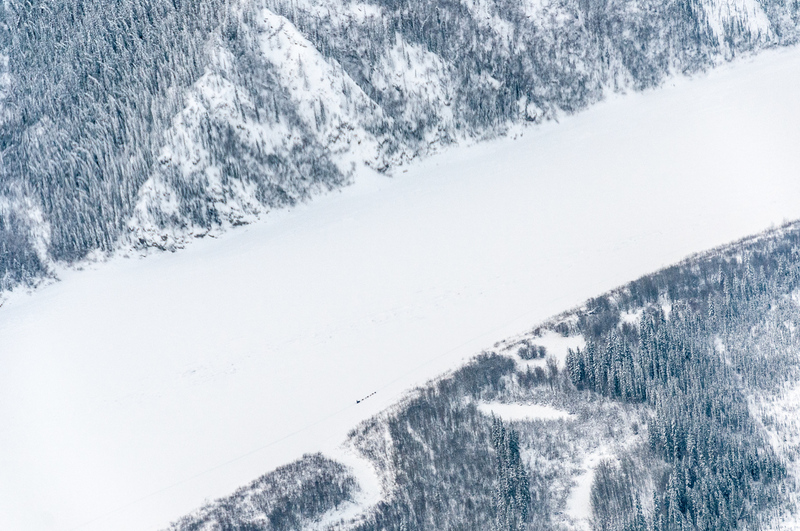 8The trail from Whitehorse to Dawson City roughly follows the course of the Yukon River. As it is frozen, much of the first part of the race is actually on the river. During the race there are no spectators, media or support other than at the official checkpoints. 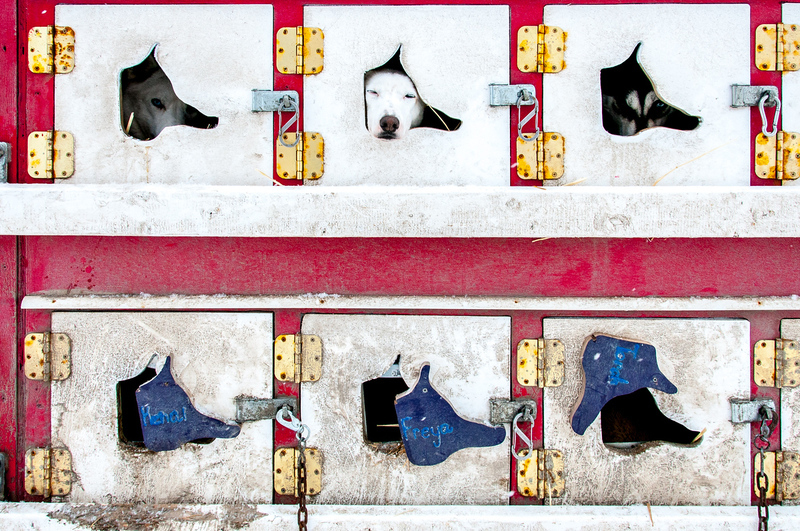 9Dogs are transported in special kennel trucks with individual compartments for each dog. 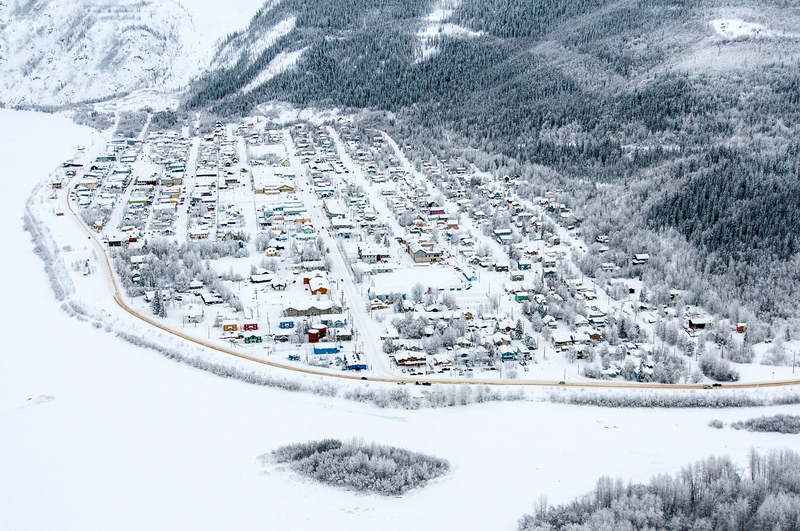 10Dawson City is the midpoint of the Yukon Quest. Here mushers and dogs take a mandatory 36-48 hour break. 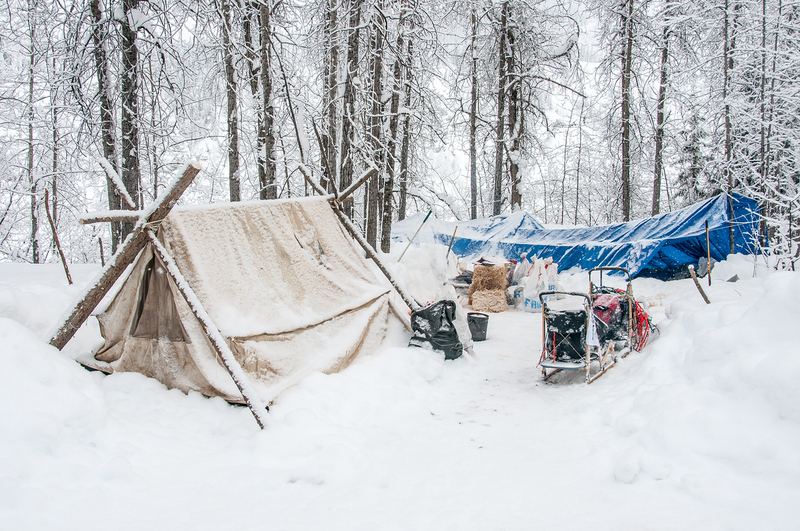 The mushers usually spend their time sleeping in a bed while their team takes care of the dogs. 11Each team has a campsite just across the river from Dawson City. 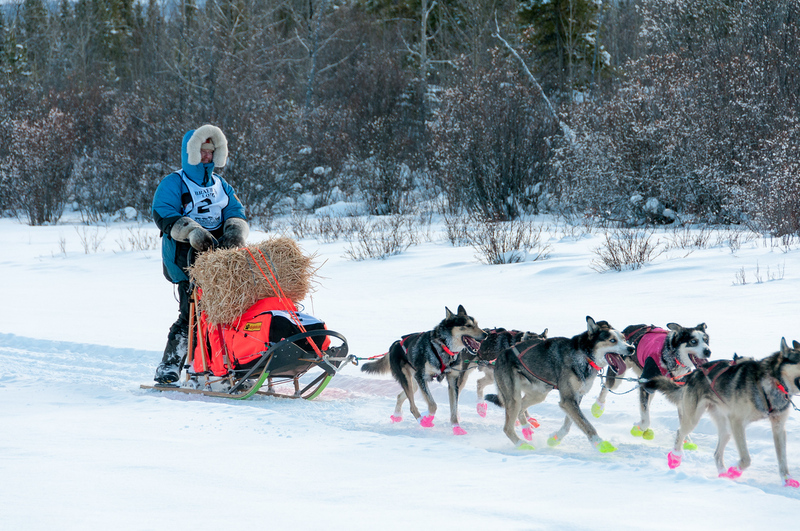 After their mandatory rest period (which was 48 hours in 2013) the teams are released based on the time they entered Dawson City. 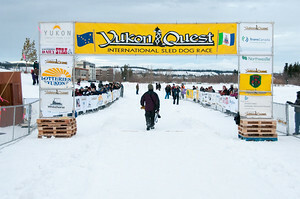 12The Yukon Quest commemorates the historical route which sled dogs transported mail during the Klondike Gold Rush. 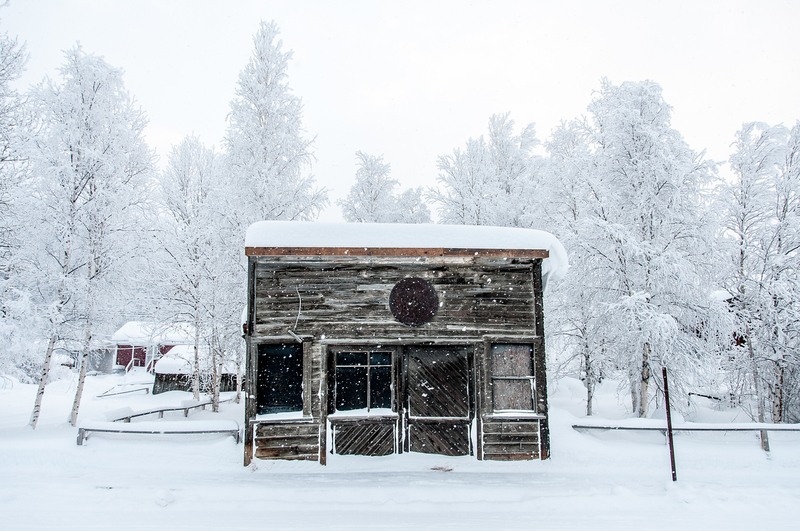 There is still evidence of this history all over Dawson City today. 13Unlike the start in Whitehorse, when the teams leave Dawson City there is no fanfare or celebration. In fact there are very few to no spectators to watch the teams depart depending on the time of day they leave. 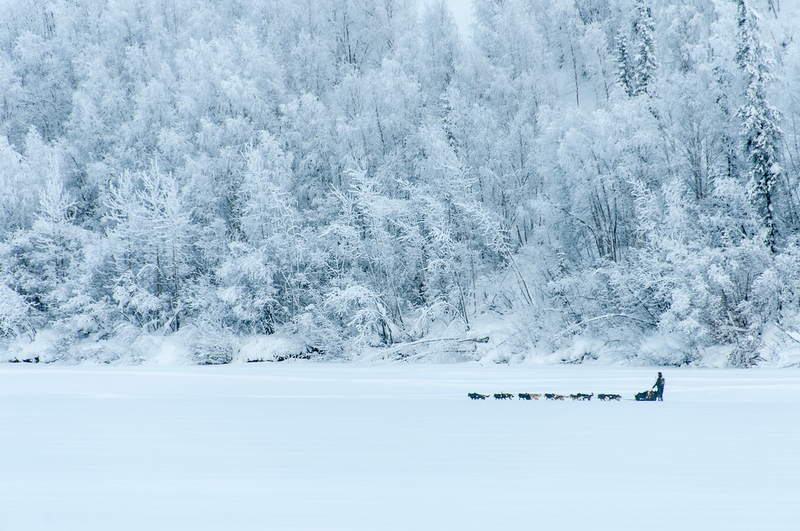 14Dog sledding might be the loneliest sport in the world. For almost two weeks, teams have little contact with the outside world, there are no spectators and they don’t even see their competitors. The winner of the 2013 Yukon Quest (Allen Moore) crossed the finish line a full four and a half days ahead of the last place musher. Blimey, what an extraordinary experience it must have been to observe such a unique and fascinating lifestyle! An interesting read, I knew nowt about the sport before reading this. Ta for sharing! Wow that looks something different, and amazing. Adding that to my many ‘to do lists’. Fascinating and so unique – I knew absolutely nothing about the sport either. Every photo looks like a postcard!! Good artcle, and the pictures are amazing. I am glad to learn that they take good care of these amazing dogs. Hey I was there! After a 13 hour greyhound bus ride, it gave one a true appreciation of the isolation that these racers are in. Great photos. It’s interesting to read. As I grew up watching the Iditarod. I think a woman one it 4-6 x? Great photos.. Thank you – I’ve been waiting for these since your trip in February. What a cool experience! 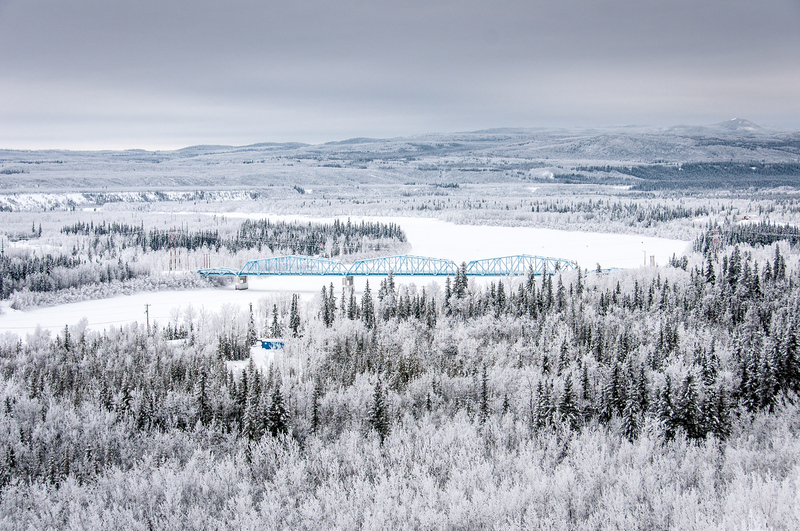 The pictures really capture the essence of the Iditarod and the surrounding beauty of the North. I think that everyone should be able to experience being in a sled and being in the middle of no where. Such a beautiful place to be, thanks for sharing!